Another wild week in the mortgage markets done and likely a new one beginning. The bond market closed last week (-50 bps) down, pushing mortgage rates and pricing higher. Luckily we had a late week rally, which reversed some of the damage done earlier in the week. The FED reserve board chief, Ben Bernanke, spoke on Friday – stating that we are no longer in a recession, but the US economy is growing slower than expected. He stated that the FED would not utilize any more of it’s tools to stimulate the economy right now, but did not rule out the possibility of using them in the future. Unless the market takes a big turn for the worse, or the FED prints more money to buy bonds – mortgage rates have likely reached the lowest levels they will go. The market had another wild week – pushing rates up and down each day. The wild swings are becoming the new norm. What this means for you as a consumer is that your mortgage quote could change thousands of dollars in a very short period of time. That is the market that we are in – so as always, if you like the rate/costs – lock it in as soon as you can, as it may not be there for long. The bond market closed last week 37 basis points higher, which in theory should have improved mortgage rates. Unfortunately it did not on all mortgage products and here is why. Rates go up quicker than they go down. What this means is that lenders are more willing to change their pricing higher when the bond market is down, then they are to offer better rates / pricing when the bond market goes up. The max high balance conforming loan limit has been $729,750 since the ECONOMIC STIMULUS PACKAGE of 2008. This max loan limit will be going down to 625,500 in the highest priced areas, and lower than that in the mid high balance priced areas. You have to get these started now if you want to close before the deadline of September 30th, 2011. 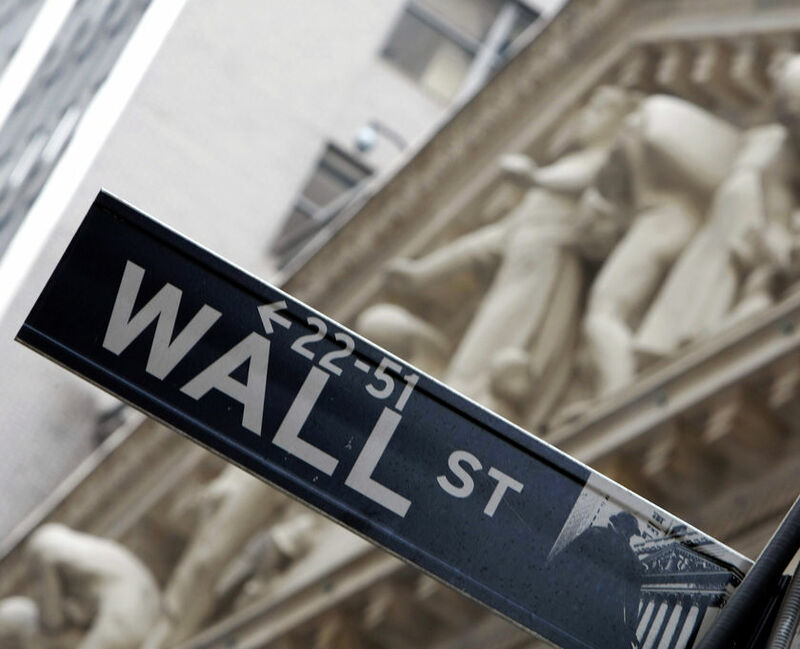 Last week was one of the craziest weeks in the financial markets since 2008. The stock market and interest rate market fluctuated greatly every day, sometimes changing mortgage pricing by thousands of dollars in a few minutes. Things can change fast due to the extreme volatility in the market. The good news is that mortgage rates went down to their lowest levels ever. Technical indicators show that the bond market is overbought right now – which means interest rates are really lower than they should be. I expect a correction in the near future pushing rates/pricing back up a little bit – maybe to 4.25% on a 30 year fixed product. My advice would be to lock in pricing if you are floating a loan or considering starting a new loan. 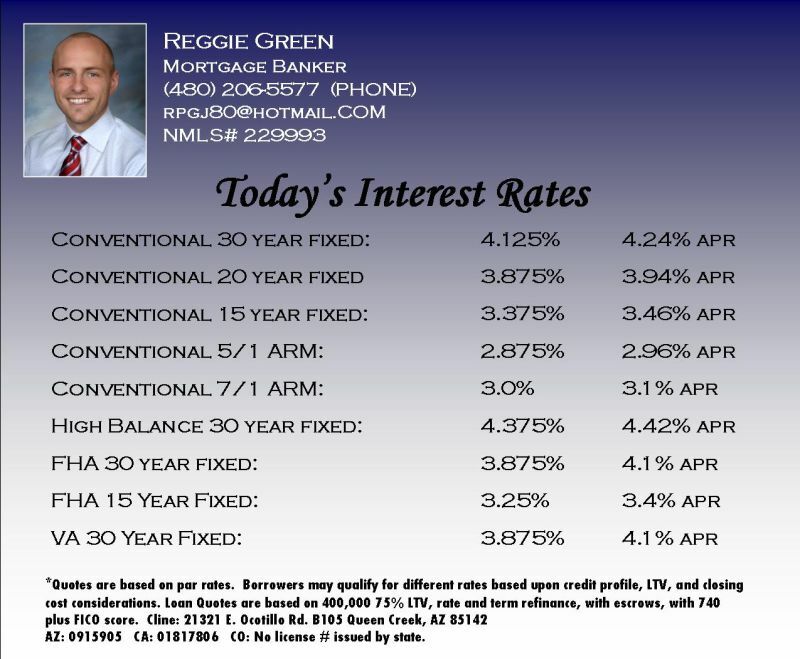 Below are current rates and pricing for a well qualified borrower. In a normal market, a large swing is 100 pts one way or the other. This is a market that over reacts to most financial news. Panic can set in very easily. If you look at the stock market – it has ended lower 4 of the past 5 weeks. When stock markets are down, interest rates usually get better. Typically a stock market can only go one way for so long before you get some sort of correction back the other way. I expect that to happen again here. That is why I recommend taking advantage of the recent rate dip if you are on the market for a home loan. Even though the FED on Tuesday maintained their commitment to keep rates low for at least the next 2 years, they have already used most of their tools to keep rates low. I do expect mortgage interest rates to remain low, but I do not expect 30 year fixed rates to remain as low as 4%. A VA loan is a veteran benefit for active duty military and/or discharged veterans and their families. A VA loan is a great loan in that it allows a veteran to do things that no other product will allow. A VA loan will allow a veteran to purchase a home with no money down – 100% financing. A VA loan will allow a veteran to loan over 80% of the home value with no mortgage insurance. A VA loan will allow a veteran to complete a cash out refinance at up to 95% of the value of the home. There are a lot of things a VA loan does – and the interest rates are typically the same or better than a conforming loan. Active duty military and veterans are eligible for the VA home loan benefit. Veterans are eligible that have completed their term of service, and were not dishonorably discharged, other than honorably discharged, or bad conduct discharged. Veterans must have served at least 90 days active duty during wartime or 181 days of service during peacetime. Reservists must have served 6 years with an honorable discharge. Unmarried surviving spouses of a military member who died during service or by the result of a disability caused by service are eligible. VA does not have very stringent credit requirements. You need a 620 mid FICO credit score to qualify with most lenders. Your past 12 months of payment history has to be relatively good. You can have some lates, but if all of your credit lines are late, there will most likely be a problem qualifying. If you have had a recent Bankruptcy – you must wait 2 years from the discharge date on a Chapter 7, and 1 year from the discharge date on a Chapter 13. You must have made all payments on time during the Chapter 13 repay back period. As far as income goes, you have to show that you can make the payment and still have money left over for normal expenses – food, gas, utilities, etc. VA will look at your past 2 years of income/employment/self employment so they can determine whether you make enough to qualify for the loan. VA does require a funding fee to complete a new loan. Sometimes the lender can pay this for you based on the rate they offer you. Typically the lender does not pay for the funding fee, and VA allows you to finance it into the loan. For first time use and for 100% financing purchase or construction loans – the required VA funding fee is 2.15%. If you can put up to 10% down, the VA funding fee drops to 1.5%. If you can put 10% or more down, the VA funding fee drops to 1.25%. If you use the VA home loan benefit for a second time, the funding fee rises to 3.3%. For Reserves / National Guard, the funding fee is a bit higher. For first time use and with 100% financing, the fee is 2.4%. If you put down up to 10% on the home, the fee drops to 1.75%. If you put 1o% or more down, the fees drops to 1.5%. 2.) The spouse of a veteran who died in service or as the result of disabilities from service. If you are currently in a VA loan, and would like to refinance (VA interest rate reduction loan), the VA funding fee is only .5% for regular homes, and 1% for manufactured homes. Please contact me for a free VA mortgage quote and qualification. A VA loan is a great way to buy a primary residence home with no down payment at a great rate. VA loans are also great for refinancing for cash out or a lower rate!! MORTGAGE RATES DROP SIGNIFICANTLY TODAY!! The bond market closed 100 bps up with the announcement from the FED that they would work on keeping rates low for at least the next 2 years. 30 year fixed rates dropped to 3.99% , 4.1% APR. Call me today if you would like to lock in your pricing – rates usually only stay this low for a day. TODAY’S MORTGAGE RATES – RATES DROP TO LOWEST LEVELS ON THURSDAY , BUT PULL BACK ON FRIDAY!! From Thursday July 28th to Thursday August 4th – mortgage interest rates improved every single day – pushing par 30 year fixed rates down to 4% on Thursday July 28th. The lower rates were all over the news, CNN, MSNBC, etc. And then Friday hit, the bond market dropped 100 basis points, and rates rose back up quite a bit. If there is a lesson to be learned here it is this: You have to be prepared to lock your loan when the rates drop. Because when rates drop to their lowest levels, they are only there for a day or two. In order for me to lock your loan – I need to have your credit and income to make sure you qualify for the loan. If you need a specific rate / costs to make a loan work for you – my suggestion is to get me your loan application and income so I can lock your loan if that pricing becomes available. (you can email me for a loan application – rpgj80@hotmail.com) I only have until 4 pm Pacific to lock a loan. Pricing can change on a loan dramatically even one day later. Rates are still great right now, but they were really great on Thursday. I expect rates to have a little more pull back next week as well. 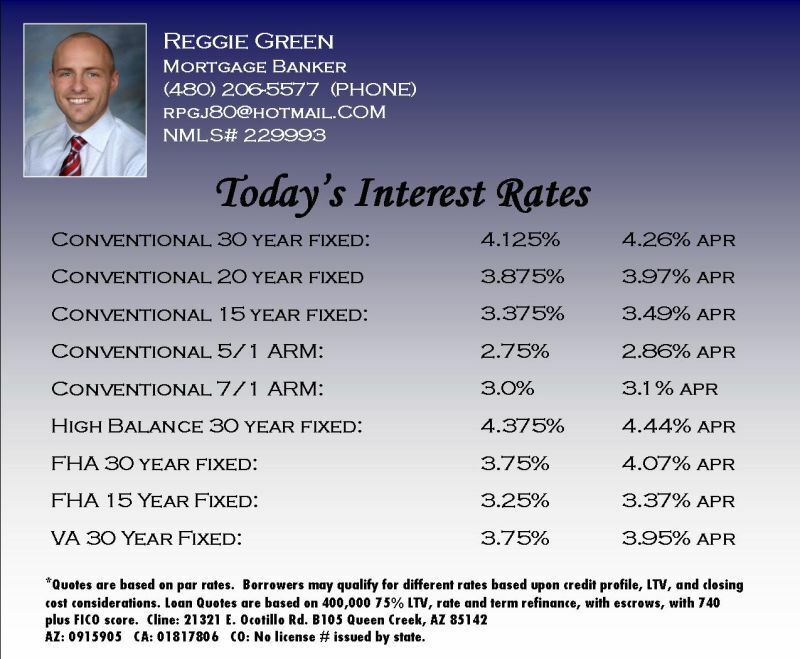 Below are current rates and pricing for a well qualified borrower. 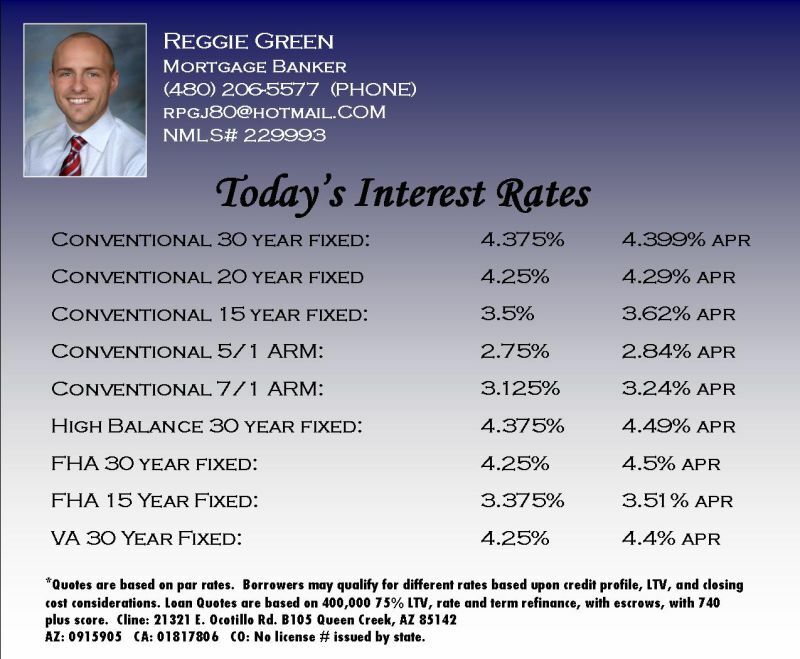 I can go below these rates, but I do not quote rates that cost over a point to get. 30 year fixed High Balance Loan: 4.375% paying .75 pts, 4.625% paying 0 pts. Mortgage banker / Loan officer for Arizona, California, and Colorado. Mortgage Rate sheet – Fixed, ARM, Variable, Interest Only, High Balance Conforming, FHA, VA, Jumbo, HARP, etc. The US debt deal looks like it will be completed. Most of us expected this to get done in the 11th hour, but when you don’t know, the markets get nervous. Even though the deal looks to be done, the stock market is down 100 points on Monday morning, pushing the bond markets up and mortgage rates lower. Last week was a see-saw all week. Luckily we had a huge day on Friday with the bond market closing 81 bps up, pushing mortgage rates and pricing to the lowest levels of the year. Last week, the bond market closed 91 bps up. Right now is a great time to lock a loan, below is the approximate pricing for a well qualified borrower on a variety of loan products. CONFORMING LOAN LIMITS CHANGING: On October 1st of 2011, loan limits are expected to decrease substantially for CONFORMING and FHA loans. In many high priced areas, CONFORMING and FHA loan limits were temporarily increased with the Economic Stimulus package of 2008. For example, in most parts of Southern California, you can now do a CONFORMING and FHA loan with a loan amount up to $729,750. Since CONFORMING loans price substantially better than JUMBO loans, many customers have been able to refinance or purchase with high balance loans at a very low rate. These temporary loan limits are expected to decrease substantially on October 1st of this year. FHA loan limits in many areas will also decrease lower than their current allowable loan amount. If you want to take advantage of these temporary loan limit increases, I would act before August 15th, 2011. The loan has to be completed and delivered before October 1st to get the old guidelines. Even though refinance typically only take 2-3 weeks, purchases can take 4-8 weeks. I would not wait if you are a consumer that can take advantage of the current program. Today’s Mortgage Rates – Down to lowest levels of the year. August 1st, 2011. Licensed in Arizona, California, and Colorado.